Most hoteliers today have little choice but to embrace the OTAs as a necessary marketing and distribution partner. Once viewed by hoteliers as merely a thorn in their sides (mostly owing to the onerous commission structures) and perhaps holding out hope that they might eventually lose traction or be somehow pummeled into submission, the online travel agencies (OTAs) have, of course, grown to become the primary route that guests use for booking hotel rooms. The “ignore them and they’ll go away” approach didn’t work out as the leading OTAs now command massive leverage in the marketplace, dominating both paid and organic search results. In fact, some industry analysts predict that Expedia and Booking.com parent Priceline Group will control upwards of 95 percent of all new hotel bookings within the next couple of years. While some of the larger hotel groups are investing heavily in various marketing technology solutions in their incessant efforts to limit the influence of the leading OTAs and drive more direct booking revenues through their own websites and distribution channels, the reality of the situation is that OTAs rule the world of hotel booking. 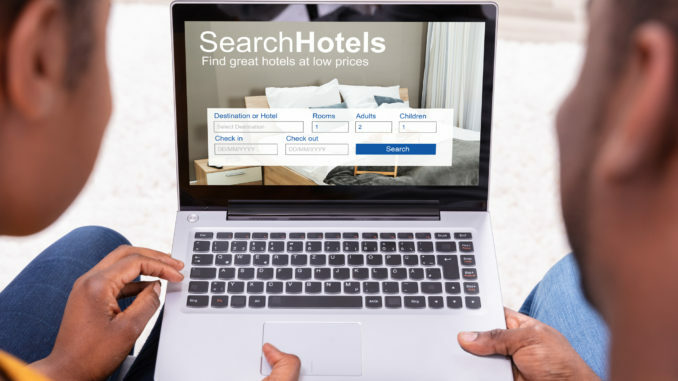 As a result, like it or not, most hoteliers today have little choice but to embrace the OTAs as a necessary marketing and distribution partner. That means listing their guest room inventory and rates on as many of the OTAs as possible in order to maximize success in securing guest bookings. That, in turn, means having technology capabilities in place that enable seamless distribution management. Needless to say, hoteliers simply do not have the time and resources to manage multiple online channels manually any more than they have the time and resources to manage rates manually. In a in a dynamic market characterized not only by continuous fluctuations in inventory and prices but also in world with myriad channels through which people can book inventory, automatic rate distribution is imperative. Fortunately, automatic rate distribution is a feature that comes fully integrated in a best-of-breed hotel management system. The feature allows hoteliers to focus their efforts on broadening their marketing and distribution reach without having to make any updates manually. In a nutshell, the technology works by linking the property management system, the central reservations system and the revenue management system into the OTAs and any other chosen marketing and booking channels the hotel uses to “get found” by potential guests searching for hotel accommodations. With this capability seamlessly integrated into the platform, information is instantly exchanged over a two-way connection between the hotel and the various online channels. Real-time rates, room availability and restrictions are automatically sent from the PMS to the online marketing and distribution channels, including the OTAs. And when a guest room is booked via one of the third-party websites, the hotel’s PMS is automatically updated in real time to reflect the change in availability. Automatic rate distribution enables hoteliers to maximize room inventory while optimizing revenue without running the risk of overbooking. To that point, hoteliers have no choice but to ensure that rates and inventory information are reflected accurately across all systems and touchpoints, including OTAs and other channels. Otherwise, the prices that are presented to prospective guests on some channels may be lower than desired or rooms presented on some channels as available may, in reality, be unavailable, and the property may be overbooked. Of course, any process that is handled manually always means that there is the very real risk of making mistakes and introducing errors, which, in this case, can be particularly costly for the hotel. As many hoteliers know from their own experiences, inputting room rate and availability changes manually can result in errors that damage the brand’s reputation and at times can lead to very significant revenue loss. Clearly, when it comes to propagating room inventory and rate updates across marketing and distribution channels, timing is everything. Even a small lag time in implementing channel updates can be a recipe for disaster. Removing manual entry and automatically keeping all booking sites updated with real-time availability and rates is imperative. Of course, manual entry of data every time there is an inventory or rate change is also a time-consuming and potentially expensive proposition if additional resources are required; yet another reason to embrace automated channel distribution. With real-time automation, a single dashboard provides transparency into the performance of all online distribution channels. At a glance, hoteliers can see which booking channels on an individual base are delivering the most revenue and which ones are underperforming. Automating the channel management process through seamless distribution technology — which, like all other features and functionality that comprise an end-to-end cloud hotel management platform, allows for remote access (including via mobile devices) — frees up hotel management and staff to focus their time and energy on what they do best. That means allowing them to run day-to-day hotel operations as efficiently and effectively as possible.